Elizabeth Lorentzen is a senior from Arlington Heights, Illinois, studying Speech and Hearing Sciences. She is also completing a minor in Italian Studies. With approximately 5 million speakers, the Sicilian language is vigorously used throughout Sicily and its satellite islands (Lewis, 2016). However, there are still numerous people who believe Sicilian is merely a dialect of Italian, not its own distinct language; the Italian parliament has failed to ratify the European Charter for Regional or Minority Languages, and Sicilian is not recognized by the national law 482 which recognizes and protects 12 languages and dialects spoken in Italy. Additionally, Sicilian is not standardly used in schools, nor is it commonly written or read by the people who use it in daily life. According to the UNESCO rankings, Sicilian is a vulnerable language, meaning there is limited language use at home by a portion of the population; meanwhile, Italian is the national language of Italy, used in schools, government, business, media, etc. (Moseley, 2010). Sicily’s history consists of many different groups ruling its land, leading to many different languages being brought to the island. With influences from Latin, Arabic, French, Catalan, Spanish, Albanian, Greek, and more, do the people of Sicily speak their own language or simply a dialect of Italian? Considering that Sicily is the largest island in the Mediterranean Sea, separated from Italy by a body of water, it should not be surprising that this land has developed a unique language. Throughout the years, Sicily was populated by many different groups, most notably the Greeks, the Romans, and the Arab people. During the Greeks’ rule over Sicily, a variety of dialects were spoken on the island. These Greek influences are still largely reflected in present day Sicilian words. Some examples of these language similarities can be seen in the following words: ‘cherry,’ in Sicilian ‘cirasa’ and ‘boy’ in Sicilian is ‘carusu.’ In addition to strong Greek language influences, when the Roman Empire took over Sicily, Latin swept through the land. Latin and Greek influenced each other, creating new vocabulary and grammar rules, but Greek still remained the dominant language in general (Mallette, 2003, p. 155). Eventually, Arab settlers arrive, and so did their language, further mixing with the already existing Greek and Latin. The Arab people played a large role in Sicilian language and cultural development; many Sicilian words related to cooking and agriculture have an Arabic base, for example, ‘zaffarana’ for saffron (Bonner, 2003, p. 33). 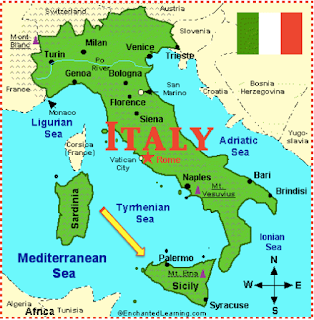 The Italian language has greatly influenced the Sicilian language, specifically in recent history. Since Sicilian is not used in schools, it is becoming more common to hear standard Italian on the streets, specifically among younger generations (Cruschina, 2013, p. 25). This is an example of how the 2 languages influence each other, continuous mixed use. Over the years, it seems as though Sicilian will continue being modified due to strong use of Italian in schools, mass media, and young people overall. Based on its vast differences in syntax, vocabulary, and grammar, Sicilian seems to be its own, unique language, not simply a dialect of Italian. The history behind how the language was formed also makes its case for why Sicilian should be considered a stand-alone language. Although Sicily is a region of Italy, more specifically the fifth most populated and largest in geographic size, there has been a long history of cultural disconnect and lack of nationalism for the Sicilian people; many people who live in Sicily think of themselves first as Sicilians while, their Italian identity takes second rank. There is also a widespread phenomenon in Italy that the Northern Italians view themselves as superior to the Southern Italians. This plays a role in negative attitudes about the Sicilian language, people claim it is a dialect of the superior language, Italian, and that it is spoken by the poor and uneducated. In more recent times, the connection between Sicily and Italy has grown stronger, mainly in the younger generations, due to mass media, improved education systems, business, increased travel, and more; however, the languages still have unique traits that maintain that Sicilian is its own, minority language, not a dialect. Bonner, J.K. (2003). Principal differences among Sicilian dialects, Part 1. IUANA (4) 29-38. Cruschina, S. (2013). The expression of evidentiality and epsitemicity: Cases of grammaticalization in Italian and Sicilian. Probus 27 (1) 1-31. De Gruyter Mouton: NY. Lewis, M. Paul, Gary F Simons, and Charles D Fennig (eds.). 2016. Ethnologue: Languages of the World, Nineteenth edition. Dallas, Texas: SIL International. Online version: http://www.ethnologue.com. Mallette, K. (2003) Translating Sicily. Medieval encounters, (9.1) 140-163.